The adrenaline rush takes over as we line up to step on the wobbly plank. The more adventurous ones take the plunge as they reach the end. Others huddle in the corner of the elevator, too overwhelmed to even look down. But once the VR goggles come off, everyone agrees: What a way to tackle your fear of heights! Surely you are wondering what’s going on here? From January 29th to January 31th, Userlane exhibited at LEARNTEC, Europe’s largest conference and trade fair for digital education. With over 11.000 visitors and around 340 exhibitors from 15 nations, it was the ideal place for the Userlane team to find like-minded people and discover the latest learning trends. From AR to Webinar – every possible form of learning and teaching was represented here. At LEARNTEC, a LOT is going on at all times: While the adults are sipping cocktails at a huge indoor beach, tiny LEGO robots teach kids to code. Companies present the latest learning tools and platforms while academics discuss the future of L&D in a rapidly changing world. Here you will encounter all of the big players in the L&D game as well as startups, schools, and universities. So much to see, hear, and try out: Workshops, presentations, meetups, as well as impressive VR/AR displays that encourage visitors to venture beyond their comfort zone. The themes of courage and curiosity were not only present at the VR exhibits. Although there was a strong emphasis on technology, the main focus was on the human side of Digital Transformation. After all, it’s about people: Fundamental changes are only possible if people dare to take the proverbial leap into the unknown – be it through getting a job in a different industry or by introducing a new software in their own company. This human-centered approach was a popular topic of discussion at many of the LEARNTEC breakout sessions and workshops. And if you weren’t at LEARNTEC this year, no problem! In this post, we’ll be giving a recap of our personal highlights from the three-day action-packed event. My colleague often says that a lot of training is only done in order to keep the CEO out of jail. If you work in L&D, chances are that you’re already familiar with Jane Hart, founder of the Center for Learning & Performance Technologies (C4LPT) and world-renowned Workplace Learning expert. Since 2011, Hart has been researching the preferred learning methods of employees. 94% of the respondents consider learning from daily work experiences as most important. Social learning and web search take second place. Only 29% consider classroom training particularly important or essential. As a wealth of new information is made available to us each and every day, knowledge becomes outdated very quickly. Yesterday’s “facts” get updated, completed, and replaced with more accurate versions until they can’t be considered as facts any longer. College degrees will be out of date before the loan is paid off. Linear career paths will become extinct. Instead, a lifetime of careers in different roles and industries will become the norm. That’s why it’s important for everyone to embrace a mindset of lifelong learning. A modern workplace learning model should enable people to become independent continuous learners, thereby helping managers and teams learn from daily work and share experiences. Enabling people to use new technologies in the flow of work without the need for formal training. Remember that “fun fact” people keep repeating about your attention span being shorter than that of a goldfish? Spoiler alert: That’s nonsense. No one actually studied the attention span of goldfish. Many learning myths have been circulating the web for years, perpetuated to the point where we now consider them as “common knowledge”. That’s why it’s good to get a reality check once in a while to separate fact from fiction. Luckily, Dr. Quinn, a recognized leader in learning technology strategy, was there to debunk popular misconceptions during his interactive session on training myths. The differences between generations when it comes to tech skills are severely overestimated. Just because a training course has been rated highly by the participants doesn’t mean that the course was effective. New technologies do not, contrary to popular belief, shorten people’s attention spans. Remember the last time you spent hours binge-watching Netflix or playing a video game? Fact is: We ARE able to focus. We’re just becoming more selective about WHAT we pay attention to. Millennials, Goldfish & Other Training Misconceptions: Debunking Learning Myths and Superstitions. As mentioned before, the half-life of knowledge is decreasing dramatically. At the same time, we have to retain more and more info. Every day we are being flooded by tidal waves of emails, push-notifications, social media feeds, and so much more. How are our brains supposed to keep up with this information overload? During his talk on memory training, Jens Voigt from the German Academy of Learning Methods introduced the ALMUT technique, a quick and simple way to memorize big chunks of information. So, what does ALMUT mean and how does it work? ALMUT stands for alphabet and mutare (latin: to wander). The learner takes a mental journey along a path paved with images that are arranged in alphabetical order (e.g. acrobat, ball, corn, dandelion, easter bunny…). To give us a better idea of what such a path might look like, Voigt used a so called ALMUT CARD with 25 alphabetically arranged images. Each image serves as a memory anchor. Let’s say you want to remember your shopping list. 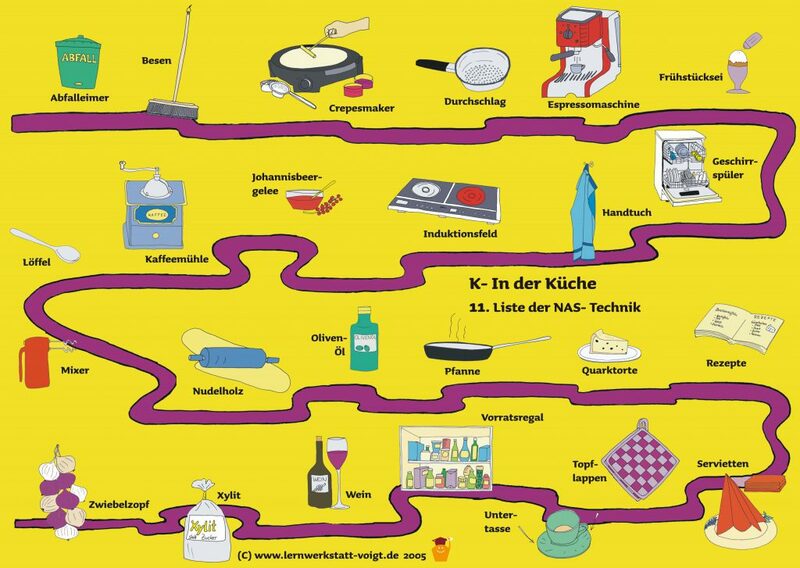 To do that, you have to mentally connect each list item to an image along the path. Whenever you mentally revisit your journey, you can easily “recollect” the info. At the end of the presentation, we had no issues reciting a list of 25 items. And the best thing is: We can recall the list to this day! Sounds too good to be true? Try it out for yourself! Not going to lie, we were very proud to find Userlaner Judith Brendelberger in the lineup of LEARNTEC speakers! Judith gave a preview of a much anticipated study Userlane conducted with Deutsche Bahn, Germany’s biggest railway operator. Deutsche Bahn decided to test interactive performance support with a pilot project to see the effects of in-app, on-demand interactive guidance on employee performance. The study results exceeded Deutsche Bahn’s expectations. One of this year’s main attractions was the area dedicated exclusively to Augmented Reality (AR) and Virtual Reality (VR). 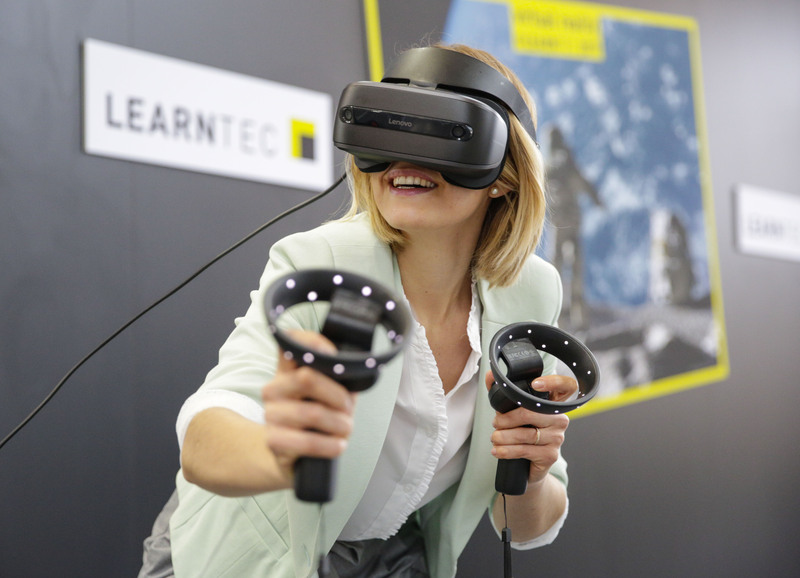 This is not surprising: The AR and VR displays offered a fully immersive experience, showing that learning can not only be fun and exciting but even somewhat addictive. Deutsche Bahn discovered that they didn’t have enough ICE 4 trains available to train all of their maintenance staff. Their solution: Developing a VR simulation solely for training purposes. Inside the simulation it’s even possible to climb on the roof! But not only maintenance work can be taught with VR. The same applies to everything from flying a plane to baking cookies. The possibilities are endless. Maybe in the near future we won’t have to leave our desks to get a driver’s license! The small LEGO robot developed by Fraunhofer IAIS teaches kids (and adults) how to code in a simple visual coding language called NEPO. So far, the initiative “Roberta® – Learning with robots“ has made coding skills accessible to over 400,000 pupils. A step in the right direction considering that coding skills are predicted to be as essential as reading and writing in the near future. Karlheinz Pape, founder of one of Germany’s biggest communities for Corporate Learning, visited us for his upcoming podcast about LEARNTEC. We were pleased to welcome Mr. Pape at our booth and answer his questions about Userlane. Stay tuned for the full interview! In Conclusion: We’ll be back! Participating in an event like this was hard work, but the kind of hard work that we enjoy! Drinking excessive amounts of cocktails to get the most out of our visit. Shamelessly looting the booths for freebies. Spending a lot of time inside a VR simulation. Reminding ourselves that we’re professionals who are supposed to take this job seriously. Feeling relieved because playing VR games technically counts as “doing research on the latest learning trends”. If you work in L&D, LEARNTEC is the place to be. If you want not only to see but also experiment with new technologies and gain insight into every area of the learning industry, then this event is an absolute must for you. Keep in mind, though, that many of the presentations and workshops happen at the same time. To avoid FOMO, we recommend planning ahead to allow enough time for all of the activities that might be relevant to you. That includes using the LEARNTEC app to put together your own trade fair schedule and contact interesting exhibitors, speakers, and visitors beforehand. Overall, the Userlane team had a great experience at the LEARNTEC (not only this year but also back in 2018, when we were awarded as Best Innovation). We certainly benefited greatly from our visit and gained many new insights into the industry. Over the course of these three days we had the opportunity to talk with people from various professions across different industries. From HR Managers to software developers and Change Managers to politicians (yes! ), we learned a lot about their experiences with Digital Transformation and the cultural shift it’s causing. We will certainly be back at LEARNTEC in 2020. Are you interested in learning more about the latest in software training? Check out this article to learn how to implement software without using traditional training methods. A former Technical Writer, Tatjana is a Content & PR Manager at Userlane. Tired of writing technical handbooks and other factually correct but otherwise absolutely bland “info dumps”, Tatjana is researching more engaging, effective and efficient ways to make technology accessible. You are most likely to find her at events, mingling with the German L&D crowd or at home, watching hour-long video essays on the cultural impact of movies and video games.